Photo by John Calvin Brewster. Passenger steamer Pomona wrecked in 1908. Pomona (#150444) (1888-1908), 225-foot steel passenger cargo steamer built in San Francisco and used by the Pacific Coast Steamship Company from 1897 to 1908. From 1888 to 1897, Pomona was owned by the Oregon Improvement Company. 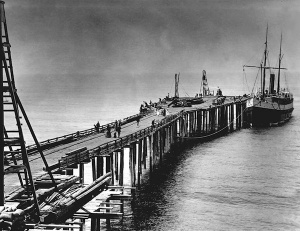 According to Santa Cruz Island Company records, Pomona delivered supplies to the island in 1890, 1891, 1894, and 1898. 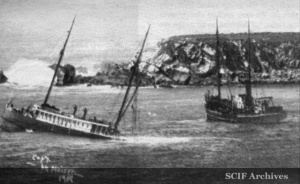 On March 17, 1908, Pomona struck a submerged rock two miles off the Russian River after which she was run ashore at a Fort Ross Cove in order to save the passengers. The California State Parks System and the state Lands Commission created the S.S. Pomona Underwater Shipwreck Park at Fort Ross State Historic Preserve where today the ship’s remains can be seen at a depth of twenty-five feet. This page was last edited on 8 September 2015, at 17:23.